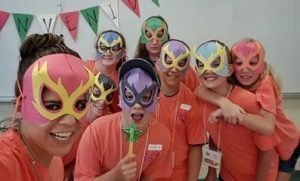 Madisonville, Ky. – Madisonville Community College’s Summer Youth College will be held on Monday through Thursday, July 10-13, on the MCC North Campus in the Brown Badgett Center (BBC). Registration is currently in progress for all courses. All students will attend three classes that meet one hour each day from 8:30 am – 12 pm. Students will be grouped into classes customized for their grade level (Grades 1 & 2; Grades 3 & 4; and Grades 5 &6). This format will allow students to select three action-packed classes for one low fee of $88. Daily snacks, classroom supplies and SYC T-shirts are included in the cost. Family and friends are encouraged to come to a 30-minute orientation on Monday at 8:00 am held at the BBC on the North Campus so they can be introduced to their children’s instructors and hear pertinent information about the week’s activities. This year’s course options are: Down on the Farm with Charity Williams, I ART Summer with Brittney Hernandez-Stevenson, Wonderful Worlds with Eva Hall, Tea Time with Sharon Mathias, Namaste & Play with Hilary Lowbridge, The Challenge with Wendy Gamblin, and Christmas in July with Glenn Riggs. For student applications, or to register, please call the MCC Workforce Solutions Department at (270) 824-8658.